This essay is the first and last in a series on Zenefits, the fastest growing SaaS business ever. A recent article reveals to us that “Zenefits expects annually recurring revenue [ARR] to grow to $100 million over the next year”. That’s 5x(!) the $20 million run-rate it had at the end of 2014. Let’s lay out the case for what they’d need to do to get to $100 million by end of 2015 and to IPO in 2016. 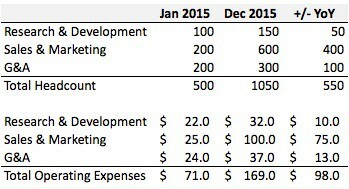 We need to first understand how Zenefits got to $20 million for 2014. Zenefits has pioneered an ingenious twist on the freemium business model — build awesome HR management software, give it away for free but make money acting as an insurance broker for the businesses who choose to purchase health insurance through Zenefits. For every policy sold, Zenefits receives on average a monthly commission of 5% of the value of the insurance premium (exact commission rates vary greatly across insurance companies and markets). Assuming typical health insurance premiums run $10,000 annually (employee plus any dependents), Zenefits would bring in roughly $500 in commissions per year per insured. According to their homepage, Zenefits has 10,000+ customers who manage 100,000+ employees. That would mean that given the $20 million figure, each employee is worth $200 to Zenefits while we calculated that commissions are closer to $500. We can reconcile this because we know that Zenefits’ customers do not need to purchase health insurance through Zenefits in order to use the platform. Thus, we can back into the metric that only 40% of all customers are currently generating revenue for Zenefits. To reach their goal, Zenefits needs to an incremental $80 million in revenue, or 16,000 more customers who each generate $5,000 in commissions. However, Zenefits must actually acquire 40,000 customers because only 40% of customers purchase insurance through Zenefits. Keep in mind that the 40,000 figure assumes there is no incremental revenue from upsell of additional services that Zenefits is launching soon (e.g. options tracking, time & attendance) and no customer churn. 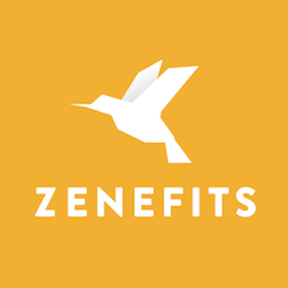 Sanity check: Are there even 40,000 new potential customers for Zenefits? Yes, in fact, there are 2.3 million businesses in the U.S. with 5–999 employees, so 40,000 is just a small percentage. 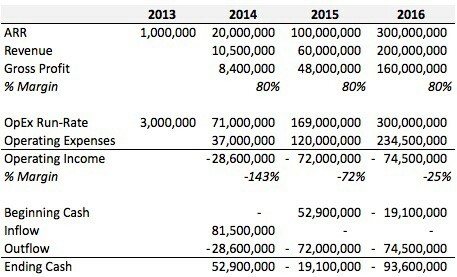 Now that we know that Zenefits needs 40,000 new customers, we must calculate the cost of acquiring these customers. To do this let’s first estimate the customer acquisition cost (CAC) for their current 10,000 customers. SaaS companies typically exhibit a sales efficiency ratio of 0.8, which is incremental revenue divided by sales & marketing costs. If we assume that Zenefits operates at typical sales efficiency, then the first $20 million in revenue cost $25 million in sales & marketing to acquire—a CAC of $2,500. Given the typical SaaS business’ CAC of 92% of annual contract value (ACV) and Zenefits’ ACV of $5,000, we see that a $2,500 CAC is relatively low (at only 50% of ACV). Perhaps we’ve underestimated sales & marketing costs, or perhaps Zenefits’s customer acquisition strategy is very efficient and was able to acquire its initial customer base primarily through PR and word of mouth. If we assume that Zenefits can continue to acquire customers for $2,500 and with a 0.8 sales efficiency ratio, they would spend $100 million to acquire 40,000 customers, resulting in $80 million in incremental revenue. It’s possible, however, that Zenefits will see a meaningful increase in CAC as incremental sales & marketing per customer may be needed to continue acquiring larger numbers of customers. In that case, Zenefits would experience a lower sales efficiency ratio and would need to spend more than $100 million to acquire 40,000 new customers. Keep in mind that customer churn and any increase in CAC could be offset by increases in customer lifetime value(LTV), or negative churn, as Zenefits begins to upsell customers on additional paid services and as customers grow and increase in headcount. Zenefits is likely to double in headcount, adding around 400 employees at its Arizona location plus another 100 employees in San Francisco. This means that they’re on pace to hire 1–2 employees per day with a team of 20 recruiters. While we would need more information to properly assess feasibility, we have seen precedent in New Relic, Box and Zendesk, each of which have doubled headcount year-over-year during pre-IPO hypergrowth. Now we know that operating expenses will increase significantly this year and cash will be needed to support this growth. To date, Zenefits has raised $84 million in venture capital. How much is remaining and what might their next financing round look like? Zenefits’ last fundraising round was $66 million in June 2014 and they now have $40-50 million left in the bank with 7–8 months of runway. For 2015 through 2016, there is a $113 million deficit to fill. My prediction is that Zenefits raises $200 million within the next few months at a post-money valuation of $2 billion. This amount should amply cover their cash burn (with reserves left over) until an IPO in 2016. Update: Zenefits announced on May 6th a new $500 million round of funding at a $4.5 billion valuation (post-money). Much larger than I predicted in both size and valuation! Zenefits is in prime position to IPO in 2016 should it achieve ARR of $100 million. Let’s look at some recent SaaS IPOs and their revenue trends leading up to their IPOs. In short, Zenefits should reach $100 million faster and spend the fewest years from founding to IPO (3 years) than any SaaS company ever. The big question is will the market be as robust in 2016 as it was in 2014 and has been so far in 2015? Yes, $100 million ARR in a SaaS startup’s third year of existence is a lofty target. However, given the talent they’ve brought in, investors backing them, and amazing business model, the Zenefits team should be able to execute on the plan and achieve an unprecedented level of startup success.